By now you've been seeing the buzz all over social media: Virtual Potluck and OXO have teamed up to bring you a Thanksgiving event. There's a bunch of recipes...including a new way to cook your Thanksgiving turkey and an awesome give away going on so be sure to stop by all the VP blogs. To add an extra dimension to this event I decided to host a 1960's themed Thanksgiving dinner and do a photo blog of all the OXO tools I used. You can check out the photos and find contest info here. In staying with the theme I made some dishes that would not normally be on our holiday table....like a raspberry jello ring and green bean casserole. As much as I wanted to be authentic with this I couldn't bring myself to use canned green beans, mushroom soup or fried onions. Using all of the OXO kitchen tools made the rest of my dinner prep so easy leaving me plenty of time to make this green bean casserole from scratch. Combine the onions, flour, panko and salt in a large mixing bowl and toss to combine. Coat a sheet pan with nonstick cooking spray and evenly spread the onions on the pan. Place the pan on the middle rack of the oven and bake until golden brown, approximately 30 minutes. Toss the onions 2 to 3 times during cooking. Once done, remove from the oven and set aside until ready to use. Turn the oven down to 400 degrees F.
While the onions are cooking, prepare the beans. Bring a gallon of water and 2 tablespoons of salt to a boil in an 8-quart saucepan. Add the beans and blanch for 5 minutes. Drain in a colander and immediately plunge the beans into a large bowl of ice water to stop the cooking. Drain and set aside. Now this is a green bean casserole that I could love! Looks awesome Theresa! Love it. I'm in charge of green bean casserole for Thanksgiving, and now will be making yours! might not be typcial but boy does it look ever so delicious! So much better than the typical green bean casserole - love it! Yum! I love dishes that remind me of Thanksgiving at my grandma's house! 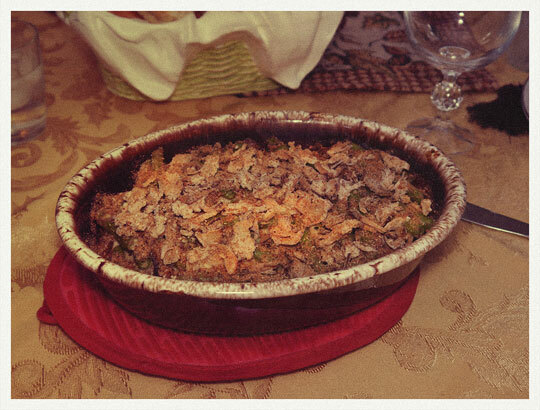 Our Thanksgiving table is not complete without a green bean casserole. Your from-scratch version sounds fantastic! I love green bean casserole but I hate to admit I have never made it 100% homemade. This version looks awesome! I love green bean casseroles, your from scratch version sounds wonderful!